Triangle shawl with tassels! Nothing can keep you warmer on snowy, windy, winter days than this cozy hand crocheted scarf. A perfect addition to your Fall and Winter wardrobe. Treat yourself. 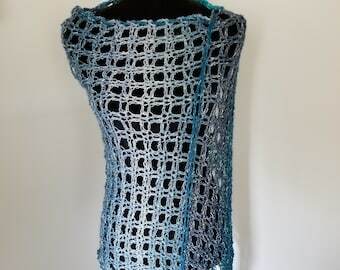 This Boho scarf can be worn across your back for warmth or or tied in front like a scarf. A striking puff stitch accents this scarf which is triangular in shape and has nice big fluffy tassels on each end. 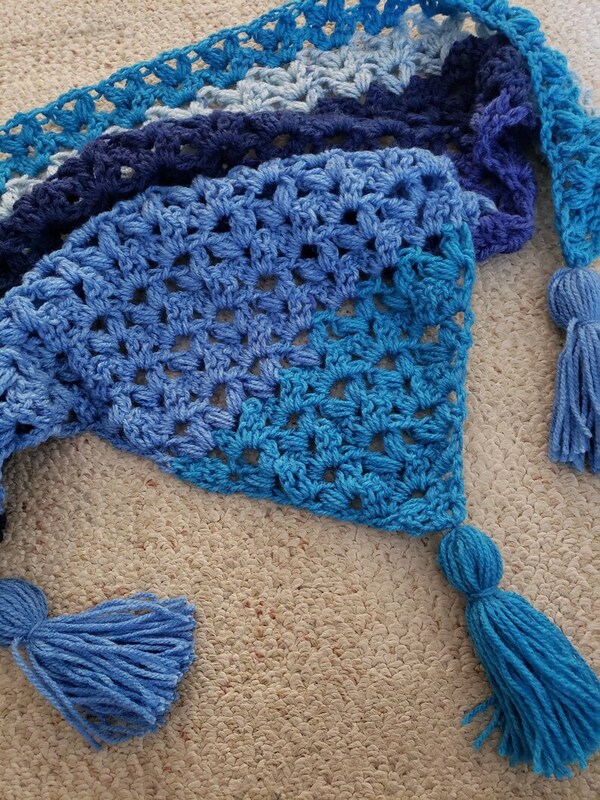 It is crocheted in blend of acrylic and wool yarn in a multicolor combination including different shades of blue. This scarf will pair up nicely with your winter jacket or coat, with jeans and a jean jacket for a Bohemian look or the sky is the limit. It measures 23" in length (not including tassels) and is 40 inches at it's widest point (not including the tassels). Care: Please hand wash and lay flat to dry. All my accessories are handcrafted by me in a smoke-free, pet-free environment. Ships in 1-3 business days.